Bit of a lapse from grace to report. Two restaurant meals in the past 48 hours. Maybe it's the realisation we're due back in England next week and will no longer be able to sit in the sun pretending it's June. Neither meal was wantonly extravagant. The first was at what is basically a seafood caff called Chez Loulou which serves some of the most brilliantly fresh shellfish and fish I've ever eaten. The second was at a restaurant that overlooks the oyster beds at Bouzigues. I'm not going to tell you the name because it's a mercifully Brit-free zone which is becoming increasingly rare in this part of France. Not that I mind my fellow countrymen, I just don't want them to outnumber the French. d) Oysters were at one time the food of the poor so I was just undertaking a bit of historical research . . . Still, not exactly frugal, I must confess. What would you do with a kilo of pigs' liver? No, don't answer that - I'm not sure I'm up to it but it's so cheap in our local French supermarket at the moment - 2 euros (£1.50) a kilo - that I feel I should be. As it was I wimped out and bought a coil of Toulouse sausage for just over 5 euros (£4) plus a whole load of veg to make one of my favourite recipes, a tray of roast veggies. It's an infinitely flexible dish that you can vary depending on what you have available. The French, as I've noted before, don't do root veg in a big way so I had to make it with out of season Mediterranean veg which went slightly against the grain but still wasn't expensive. I used an onion, a large red pepper (much sweeter here, don't know why), a large courgette, a bulb of fennel two plum tomatoes. You simply prepare and quarter or slice them put them into a large roasting tin, season (salt, pepper, thyme and 4 cloves of garlic, bashed and left whole), slosh over some olive oil, mix the whole thing together and roast in a moderate to hot oven (about 190°-200°C, depending on the veg) for about 45 minutes to an hour, tossing them again half way through. You know when they're done when the veggies are nicely caramelised. It's a really good dish to make from a veg box when they never seem to give you very much of anything or from end of day cheap veg from a market stall. I could eat it every week. Today is one of those rare days when the weather is worse in France than it is in England. It's simply chucking it down. Cue soup for lunch. A quick raid on the fridge reveals some outer leek leaves I'd felt moved to save for an occasion like this, some celery (with a lot of leaves which is good) and some chopped serrano ham (like bacon bits or lardons). That looked a bit insubstantial so I also unearthed a large tin of flageolet beans thinking I could use half for the soup and half with tonight's supper of leftover roast lamb. I simply fried the serrano ham in olive oil for a few minutes (could have used chopped streaky bacon), added the chopped leeks and celery and a pinch of dried thyme and cooked them slowly with the lid on the pan for about 7 or 8 minutes. I then added half the tin of beans - drained and rinsed - and about 600ml vegetable stock made with an organic (but as it turns out rather over-salty) stock cube. However hadn't added any extra salt so OK.
Once that was cooked (another 7-8 minutes) I chucked in a handful of chopped celery leaves and tasted it. Quite a predominant bitter celery note which needed correcting - with what? Diced fresh tomato, ideally, or a dash of passata but none to hand so in went a small squirt of ketchup (I don't want you to think I'm obsessed with ketchup - it's just an ingredient you generally have to hand if there have been kids anywhere in the vicinity.) Worked anyway along with plenty of freshly ground pepper and a drizzle of olive oil to serve. Could have scattered over some freshly grated parmesan if I'd had some. When I thought about it afterwards I realised what I'd created was a two vegetable minestrone which you have to admit sounds a lot nicer than leftover vegetable soup . . . I posted on steak a couple of days ago but Blogger wiped the lot for some unfathomable reason when I pressed the Publish button and I was so cross it's taken a full couple of days to resume. A favourite French recipe is bavette aux echalotes (skirt with shallots) which could equally well be called bavette au vinaigre because it uses a full 75ml (about half a small wine glass) of red wine vinegar. You heat a frying pan until really hot - almost smoking. You lay in the steak slices and cook them for about a minute to a minute and a half each side, depending how well done you like your steak and set them aside on a warm plate. Turn the heat down, add a bit more oil and butter and fry the shallots or onion for about 5 minutes or until soft then pour in half a small wineglass (75ml) of vinegar which will sizzle alarmingly. Press on and cook until the vinegar has almost evaporated then add a good tablespoon of ketchup and a good glug of wine (again about 75ml) or wine and stock. Cook for another couple of minutes then season with salt and pepper and taste. When you've tweaked it to your satisfaction slip the steaks and their juices back into the pan and heat through for a minute. Then serve with a good dollop of mash if you've had the forethought to cook some. Or frites. Or a green salad if, like me, you're trying to lay off the spuds. This seems to have turned into a recipe but it's really more of a guide to how the French tackle cheap cuts and manage to make them really tasty. Except no self-respecting Frenchman would use le ketchup, I'm sure. "Are you going to have a place for folks to make suggestions for your book? I've got a couple good ideas that have worked well for us." This sounds a lot more fun than my reluctant efforts at weight reduction - though low fat dairy is frugal, believe me. It's so dull that you don't want much of it . . . Anyway over to you, Bob, and anyone else who'd like to share their thoughts . . .
Much coverage in the papers over the last few days on Delia's new book 'How to Cheat at Cooking' a collection of recipes based on time-saving products. Now you might think that would make the recipes costlier than cooking them from scratch but that isn't inevitably so as I explain on my website www.beyondbakedbeans.com today. Last night was a case in point. Rooting around in the cupboards (it was a No Food Shopping Day) I found a jar of puttanesca sauce - not difficult to make, admittedly, but costly if you don't have olives, capers and anchovies already to hand. The trouble with ready made products like this is that they tend to be bland so I fried off the last of the spring onions I bought a couple of days ago, added two crushed cloves of garlic and scooped in the sauce, finally adding a big handful of chopped parsley (one of my must-have fridge ingredients). Tossed together with half a pack of spaghetti it made a really tasty - and frugal - meal for two. Bad news from the scales. I have not only failed to lose the weight I put on over Christmas, I have acquired a couple of kilos more. Which makes me about four and a half kilos overweight in total. Where did it all come from? All too obvious, when you start to think about it. Bread, cheese and wine - the three things I love most to eat and drink. Working on any cookery book tends to pile on the pounds but acquiring a frugal mindset is even worse. You convince yourself that no ingredient must be wasted so you find a home for it. Human hoover syndrome . . . This is a dilemma I'm going to have to get to grips with. I need - urgently - to lose weight. I need to test recipes. I simply need to eat less. A good start with a scratch salad for two for today's lunch made from leftovers from the fridge - half a small cucumber, half a green pepper, a head of chicory, the green bits from a large, sweet spring onion and a handful of parsley. All chopped, sliced or cut into chunks and tossed with a dressing made from a dessertspoon of tarragon vinegar, 2 dsp of basil-flavoured olive oil and 1 dsp of grapeseed oil (cheaper and lighter than using all olive oil). To my portion I added a few fine shavings of sheeps' cheese and a small chunk of fromage de tete (a very frugal jellied ham paté, a bit like brawn) and half the day's bread allocation. Surprisingly delicious and satisfying but can I keep it up? One of the things we're never short of in this household is leftover wine. Not because we're a couple of old soaks or, as the Government would have it, pernicious 'middle class wine drinkers' but because when I'm not writing about frugal cooking I'm writing about wine. This puts me, I know, in an enviably better position to reach for a bottle mid-recipe than most households, but - more importantly - reach for a drinkable bottle. There's a general idea that you can chuck in any old wine but it isn't so. On the 'rubbish in, rubbish out' principle if you add a wine that's been open for a fortnight and tastes like vinegar your dish will end up tasting of vinegar too. That doesn't mean you have to buy special 'cooking wine' - indeed I'd strongly advise you not to. It's the lowest of the low in the wine world. But you do need something that's fresh and clean and which you'd be prepared to drink yourself. And for certain recipes - a coq au vin or a daube for example - it pays to add something a touch more characterful. A good trick if you're cooking the dish for a long time is to add a final dash of fresh wine five minutes before the end to lift the winey flavour. At least that's my excuse . . .
One of the interesting things about tracking the visitors to your blog (through the relatively easy to understand Google Analytics) is that you discover what they're looking for when they stumble upon you. Which this week included the intriguing phrase 'frugal fish stock'. If I want an extra fishy flavour in, for example a fish pie or a soup or even to make some frozen prawns extra prawny, I simply add a dash of Thai or Vietnamese fish sauce (nam pla). You need to go easy with it - it's a bit like truffle oil, a few drops will do, but it works. Without making your kitchen smell vile. Oh, and you'll find it much more cheaply if you have a Chinese or other Asian supermarket within reach than you will in your local supermarket. Stuffed mussels are a bit of a delicacy here in the Languedoc - an odd surf'n'turf combination of giant mussels stuffed with minced pork served with a garlicky tomato sauce. They taste a bit like a faintly fishy meatball - nicer than it sounds to those to whom it doesn't sound that appealing. I justified it on the grounds that they weren't outrageously expensive - just over 10€ (about £7.50) for the two of us - and that I'd never get round to stuffing mussels myself. We drank the modestly priced Merlot we bought the other day to make up for it. Most of you will, I guess, be familiar with the French Paradox: the strange situation where the French have a lower rate of heart disease than the rest of the western world while knocking back vast quantities of wine, cheese, charcuterie and other foods rich in saturated fats. I must say it surprises me. The classic French diet is veggie lite as we're discovering to our cost. A typical day's eating is baguette for breakfast, some kind of meat for lunch, rarely served with veg other than as a superfluous garnish and a couple of oeufs a la plat (fried eggs with yet more baguette) or occasionally a bowl of vegetable soup for supper. All followed by cheese. The only veg the French seem to really like is 'salade' as in the old dictum 'jamais un repas sans salade' (never a meal without a green salad). It's not that the food shops don't have any veg or fruit just that they all seem a bit tired and out of season. As in the UK they're flown in from warmer climes, largely Spain and Morocco. And seldom, it seems, make their way into restaurants where there's clearly no call for them. My mother-in-law, who has lived in France almost all her life, actually pushes the veg to the side of her plate if she's unlucky enough to be served some. How do the French stay so healthy? Beats me, particularly as ready prepared meals seem to be taking over a larger and larger proportion of the supermarket. 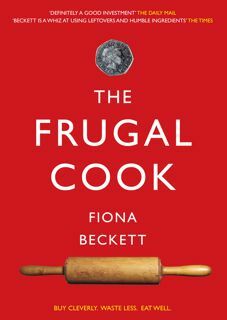 For this particular frugal cook, keen to eat as much fresh, local produce as possible, it's quite a struggle. Thwarted in our desire to support our local shops by the fact that they all seem close on a Monday afternoon (and at lunchtime, of course) we headed off to the recently opened local Lidl. Lidls and Nettos are popping up all over the place in the south of France. Hopefully they won't take business from the local shops but the dreary Intermarché and Hyper U. Still, nothing much for supper so on down the road to Hyper U which was larger and more depressing - a bit like Asda on a bad day. I did however manage to find some cheap steak (aiguillette) for €4.60 (£3.43) and some belly pork for 6.15€ (£4.59) to eat with beans tomorrow night when we're having our former next door neighbour over for supper. Bavette - one of my favourite cuts in France (skirt in the UK) - seems to have disappeared off the shelves or have soared in price to around 18€ (£13.43) a kilo which I suppose isn't expensive for steak but galling when you could until comparatively recently buy it for about 12€. I think it's suffered the same fate as lamb shanks which used to be cheap too. Once telly chefs get hold of an ingredient the price invariably goes up. Food in France ain't what it used to be. Bread is central to our life here in France. Like the French we buy it every day which means endless bits to use up. The village baker makes really great sourdough baguettes* which I slice at the end of the day and put in the freezer. When I have a big batch I make croutons or crostini. The difference between the two is that crostini - bases for patés or spreads - need to be crunchy whereas croutons need to be baked hard, especially if they're going in a soup. Otherwise you get soggy bits of bread floating around. So the croutons are best baked plain and unadorned (at about 180°C/Gas 4 for 15-20 minutes - slightly longer from frozen) while I spray the bread rounds that are destined to be crostini with a fine mist of olive oil before I bake them. Both keep crisp in a sealed container for about a week. Yesterday - apart from the morning bread purchase - was a real leftovers/storecupboard day. Various odds and ends of charcuterie, hard boiled eggs, cheese and a salad for lunch. A jar of Provencal-style fish soup with rouille I unearthed in the cupboard for supper. With the croutons and some grana padano as I didn't have the more usual accompaniment of gruyère. It worked perfectly well though. * In the UK I use ciabatta. Any of you who have been in a professional kitchen will know that most chefs have a pan of stock or demi-glace sauce on hand to deglaze their pans. Well, you can do the same just as effectively with chicken stock. The carcass of the chicken I bought a couple of days ago has made the most fabulously rich, jellied stock which I was saving for a soup or risotto. But the Toulouse sausages I was frying for lunch today produced such great stuck-on pan juices I had to prise them off somehow* and the stock was conveniently at hand. Two or three ladlefuls and I had some really intense rich pan juices that went perfectly with the accompanying lentils (cooked with garlic and parsley). I could have used a little wine or wine and stock combined but sometimes wine can make a sauce too acidic if you haven't time to cook it down. And there's still enough stock for the soup . . .
One of the things I've been thinking about a lot lately is how important recipes are. Or rather aren't. Basically they're a set of guidelines. Too often we take them as gospel. Certainly I did when I first learnt to cook. Unless you're shown how to cook you tend to take instructions literally. If a recipe says 2 large eggs and you only have medium eggs you go out and buy some. If it says a pinch of cayenne and you only have chilli powder or hot paprika you don't know you can use those perfectly well. Frugal cooking is about making use of what you've got rather than continually buying new ingredients, often for just one recipe. Last night was a case in point. Couldn't remember what other ingredients there were in the recipe and came home to find I needed two lemons. Fortunately there was a rather elderly lime lurking in the bottom of the fridge so I used that and some tarragon vinegar instead, deglazing the pan with the vinegar to get rid of the vinegary taste. (Could obviously have used ordinary white wine vinegar) No chicken stock either yet so used some vegetable bouillon powder and some white wine as recommended. Never a problem to find wine in this household but I could have got away without it. I also used less chicory than the recipe recommended because I wanted to save a couple of heads for today. Despite all the changes the dish tasted great and cost me less than it usually would. Am in danger of getting intolerably smug. Yesterday's shopping trip wasn't wildly exciting but yielded some good bargains. 2 kilos of oranges (11 in total) for €1.99 (£1.48), a kilo of endive or chicory for €1.39 (£1.04) and a huge bunch of fresh flat leaf parsley for 78p. That'll last all week. I don't know why chicory is so much cheaper in France. You'd be lucky to get two heads in England for the price I paid. We'll bake some tonight with the 'Label Rouge' chicken we bought (also reasonable value at €6.53 or £4.86) and probably have some tomorrow wrapped in ham topped with cheese sauce but today I used two to make a simple salad together with a couple of the oranges, some chopped green olives and a can of mackerel (the latter ingredients retrieved from the back of the storecupboard). And a generous handful of chopped parsley. The dressing was made from the juice of half of one of the oranges and some of the oil from the olive jar. Lots of pepper - a bit of cayenne wouldn't have gone amiss - but you couldn't fault it for healthiness. Oily fish and all. If you can't get hold of any cheap chicory you could substitute fennel or celery. Incidentally, as you may have gathered, I didn't flake out as a result of eating the out of date Caprice des Dieux which was perfectly fine. Not that I would urge you to follow my example. Heaven forbid. How much do sell-by dates matter? I've done a lot of chucking out in the last 24 hours. Three pieces of cheese from mother-in-law's fridge, one from my own. A couple of them were well over the hill (oldies are hopeless about sell-by dates) but mine, a piece of Comté that officially expired on the 28th of January didn't look too bad. I remember when I was a child my mum would have simply cut away the mould and cheerfully served up the rest but if I advised you to do that the health police would be down on me like a ton of bricks. So out it went. What I should of course have done before going away was grate it and freeze it then I could have added it to a sauce or a topping. Hey ho . . . I did however find an unopened box of Caprice des Dieux, a creamy brie-style cheese to which my youngest son is very partial but somehow escaped his attentions over Christmas. That expired on the 21st of January, almost two weeks ago, but looks - and smells - absolutely fine so I shall risk it. You wonder what they add to it to give it this kind of shelf-life. If I survive I'll report on the outcome. To compensate for all this waste I raided the fridge and storecupboard for our lunch - spaghetti amatriciana-style made with some leftover pancetta (in date, I hasten to add), a small jar of tomato and chilli pasta sauce, extra garlic and a dash of red wine vinegar (useful for adding zip to shop bought sauces). Some parsley would have been nice but we haven't been shopping yet. That pleasure is to come. Like many Brits these days we split our time between England and France. We have elderly mums in both countries both of whom like us to spend as much time as possible with them. This month it's my French-based mother-in-law's turn. So the frugal eating experiment moves to France. It'll be interesting to see how much cheaper it is. Unfortunately the exchange rate isn't too great at the moment but food generally costs less than in the UK. One of the problems about using leftovers is that everything can end up looking sludgy. I fell into that trap last night with my pheasant and mushroom pilaf. Good though it tasted it looked unrelievedly brown. Other ingredients, currently missing from our store-cupboard would have also helped. Some finely snipped dried fruits (apricots or figs would have been nice with the pheasant); some nuts to add crunch (we normally have some brazil nuts lying around but cashews or pistachios would have worked). Oh, and a final squeeze of Seville orange juice would have been lovely. They'll be gone from the shops by the time we get back so must buy a few to freeze. Although you can create a similar flavour by mixing orange and lemon juice they have a unique aromatic bitterness which gives a lovely lift to game like pheasant or duck. Yesterday I bought a pheasant. It cost £5 which isn't bad if you compare the cost with a free-range chicken but I hesitated because it feels to me like a luxury ingredient. That's very much an urban point of view. If I was living in a country village then I might well have been able to get a brace for that price or, indeed have traded something I'd grown or produced for a free bird from a neighbour. Game is cheap in the country. If I was thinking of making a curry on the other hand I would probably pay far more for my ingredients than I would in a large city. So you can't be absolute about which ingredients are cheap. Anyway, I pot roasted the pheasant for about an hour and a half with some root veg spiced with sweet smoked pimenton and a pinch of cinnamon, a small (about 50ml) glass of leftover Christmas port, a similar glass of white wine and some stock. After it had been cooking for an hour I removed the lid for the remaining cooking time to brown the bird. While the pheasant rested I skimmed the fat off the pan juices (tiresome but well worth doing). We ate the two breasts with the roast veg and stir fried sprouts and Jerusalem artichokes which I'd first boiled and then peeled (easier that way round than peeling them first). The veg by the way cost £1.78. The legs and remaining meat on the carcass will make a pilaf for tonight. The carcass can be used for stock for a soup. The leftover veg can be fried up bubble and squeak-style with some cold ham or other cold meat. With a few modest additions we should get three more meals for our £7 outlay.